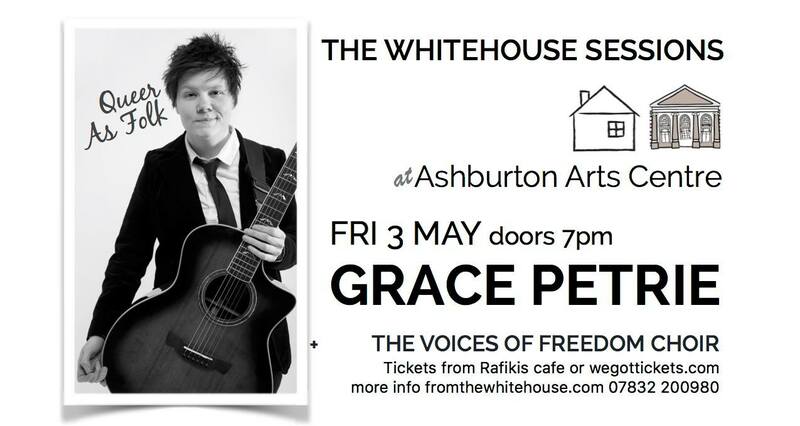 Whitehouse Sessions is very happy to present Grace Petrie at Ashburton Arts. Grace has toured with Billy Bragg and Frank Turner, supported comedians Robin Ince and Josie Long, and collaborated with Leon Rosselson and Peggy Seeger. She is a frequent guest on BBC Radio 4’s the Now Show and has appeared on Channel 4’s Random Acts. Her new album ‘Queer As Folk’ was released Sept ’18. She’s the urgent, pulsing, compassionate talent this world desperately needs. Tickets in advance £12 advance, in person from Rafikis (next door to the Arts Centre), or £14 on the door. Accessibility: Ashburton Arts has flat access from street. PA tickets available on request. Wheelchair users, please get in touch with the box office in advance if possible.